Seicento Baroque Ensemble invites you to explore the marriage of sonorities between voices and strings. Baroque-era composers exploited the unique timbres of instruments and voices, and the effect is as direct today as it was four hundred years ago! 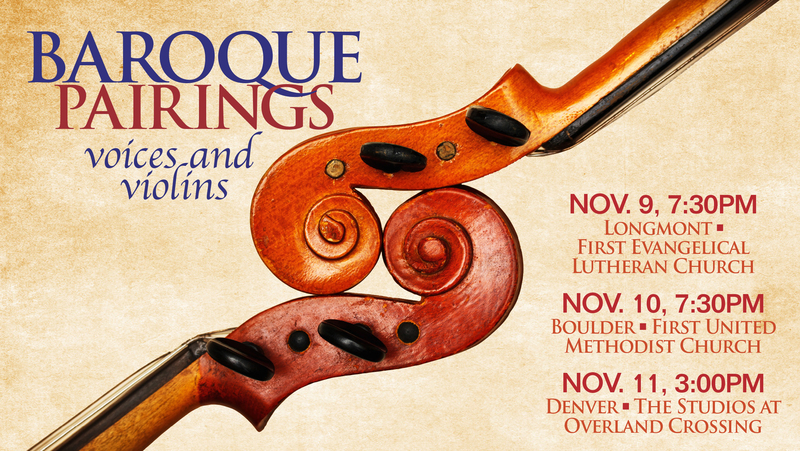 This program focuses on works for voices paired with two baroque violins and continuo. These will be complemented by instrumental works that feature the idiomatic writing for strings. Composers will include Italian nuns Isabella Leonarda and Chiara Margharita Cozzolani, Jewish violinist and composer Salomone Rossi, as well as Monteverdi, Buxtehude and Schütz. ADDITIONAL PERFORMANCES: Saturday 11/10 in Boulder at 7:30PM (pre-concert talk at 6:30), and Sunday 11/11 in Denver at 3:00 (pre-concert mixer at 2:00).